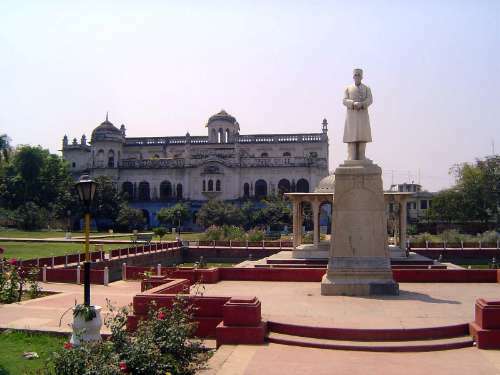 Lucknow today is a city of two million people and the capital of Uttar Pradesh, India's most populous state, but neither this size nor this status have eased the very rough ride foreign visitors have given the city. 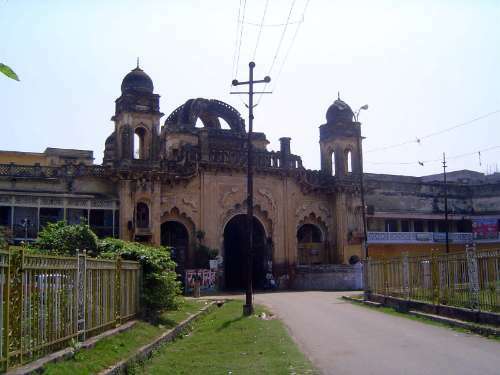 Murray's Indian handbook in the 1920s stated with customary certainty that "the buildings at Lucknow are nearly all of a degraded and barbarous type of architecture, and apart from the two tombs in the Kaisarbagh and the Jami Masjid, not one of them possesses any real architectural merits, though the large hall of the great Imambara is a very grand one." 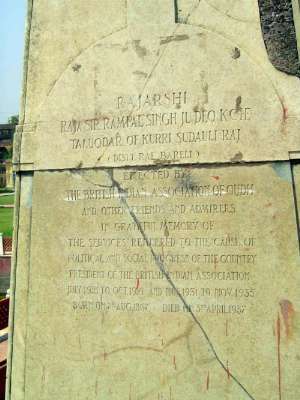 Lucknow played a major role in the Mutiny or Rebellion of 1857, which may explain some of this hostility. 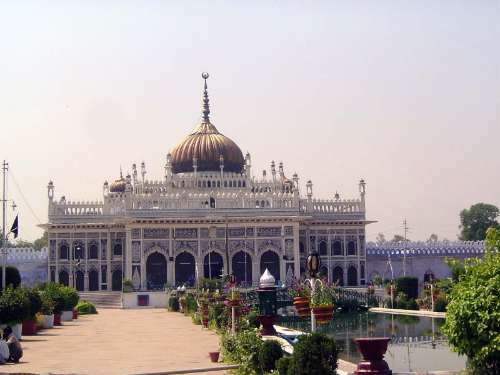 So may the character of the nawabs of Awadh, or Oudh as the British called it. 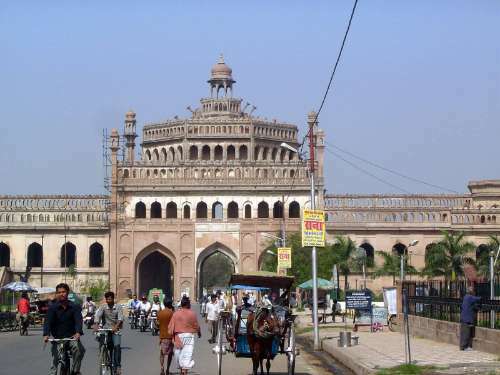 From 1775 to 1856 the nawabs made Lucknow their capital, and of them Murray writes: "No reigning dynasty of India ever showed such a series of vicious and incompetent Chiefs...." Then again, Lucknow's sorry reputation may be purely esthetic. 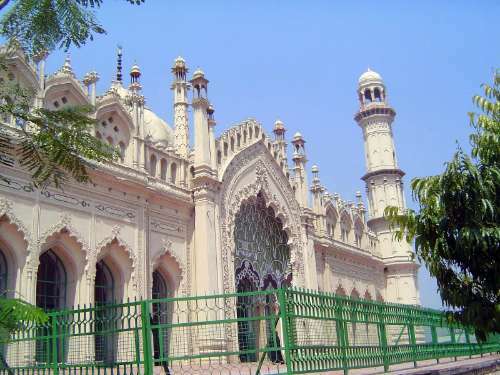 James Fergusson, who surveyed India's architecture in the 1830s, slammed Lucknow. 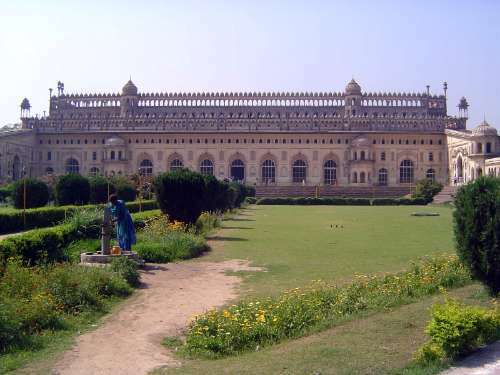 He writes, for example, (II, 324) "If mass and richness of ornamentation were in themselves sufficient to constitute architecture, few capitals in India could show so much of it as Lucknow. It is, in fact, amazing to observe to what an extent this dynasty filled its capitals with gorgeous buildings during the one short century of its existence, but all--or with the fewest possible exceptions--in the worst possible taste. 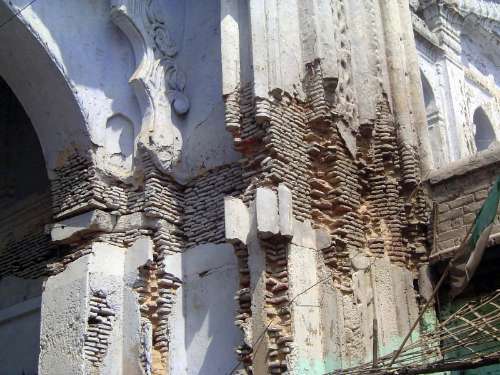 Whatever may be said of the Renaissance, or revival of classical architecture in Europe in the 16th century, in India it was an unmitigated misfortune." Fair judgment? See for yourself. By the way, the pictures should ideally be juxtaposed against the historic photographs spectacularly reproduced in Rosie Llewellyn-Jones, ed., Lucknow: City of Illusion (2006), a book showing the city's monuments as they were in the late 19th century--partly in ruin but for the most part in much better shape than they are today. The nawabs had come to India in the 18th Century from Persia, and to Persia in the 16th from Iraq. 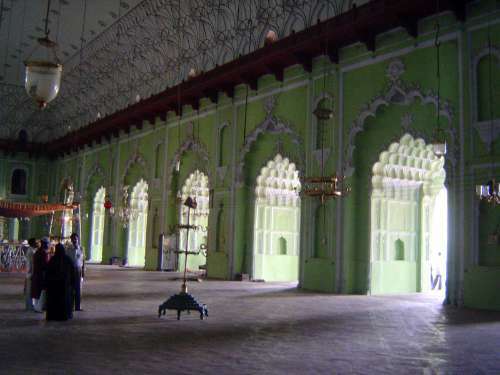 They were Shia and their most distinctive architectural creations were imambaras, literally "dwelling places of the Imam." 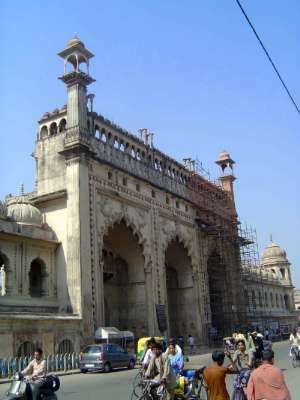 Here is the Rumi Darwaza, the outermost of the three gateways to the Bara Imambara, the great imambara. 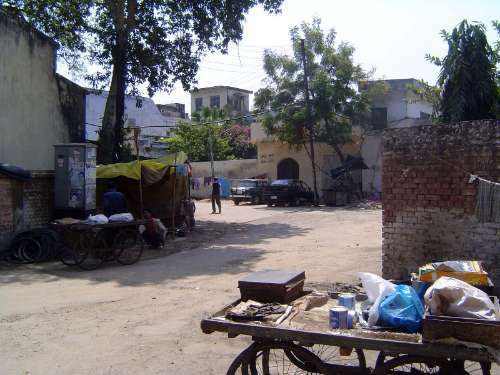 Beyond the gate lies the first of three courtyards, though it is now bisected by a busy road. Built in 1784, the gate was nominally modelled on the entrance to the Sublime Porte in Istanbul. Murray insists that it is "much disfigured by absurd decoration." The Rumi Darwaza again, this time from inside the first of the three courtyards. The structure is composed of thin bricks, plastered. We're on the Ganges Plain, after all, a long way from the sandstone used in Delhi by the Mughals--who, it happens, had set the nawabs up as governors but had then lost control of them. It didn't take long for the British to confiscate much of the territory of the nawabs, along with all of their territorial ambitions. 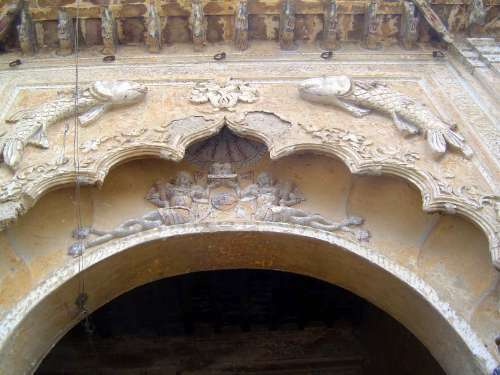 The nawabs were left with little to do but amuse themselves with projects such as this one. We're still inside the outer courtyard, but this time the view is perpendicular to its axis. In front of us is the gateway to the second courtyard. Facing that gateway is this pseudo-gateway. 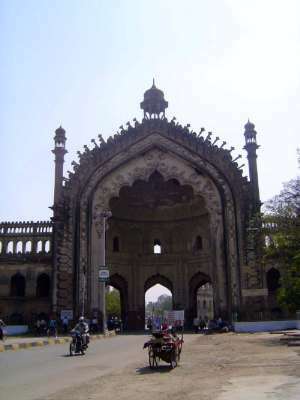 It's a jawab gate, literally an "answering" gate, a duplicate built for the sake of symmetry. It leads nowhere. 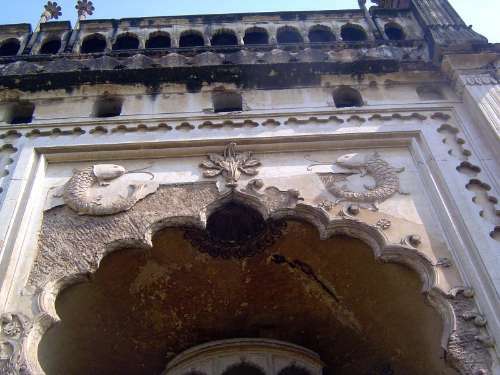 A detail of the entrance to the second courtyard: the emblem of the fish was given to the nawabs as a badge of rank by the Mughal emperors. A closer view, revealing the brickwork underneath the plaster. We're inside the second courtyard and looking to the gateway leading into the third. 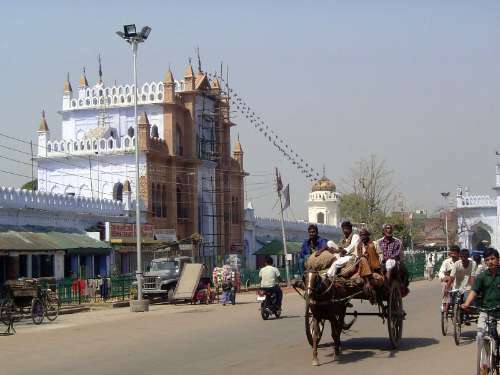 The imambara proper can be seen in the distance, while the minaret of a mosque lies to the right. The orientation of the mosque breaks the symmetry of the emsemble, but there was no alternative: the mosque had to face Mecca, and nearby hills precluded orienting the whole complex that way. 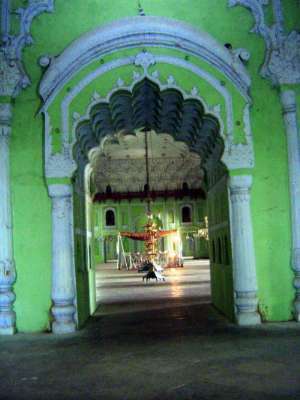 Here, from the third courtyard, is the Asafi Mosque, the mosque of Asaf-ud-Daula, the nawab responsible for the Bara Imambara. Non-Muslims may not enter. 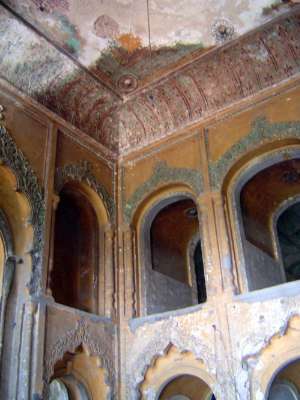 Sidewall of the third courtyard. Let's go through. A patch of jungle, laundry, wires, and the Asafi Mosque. 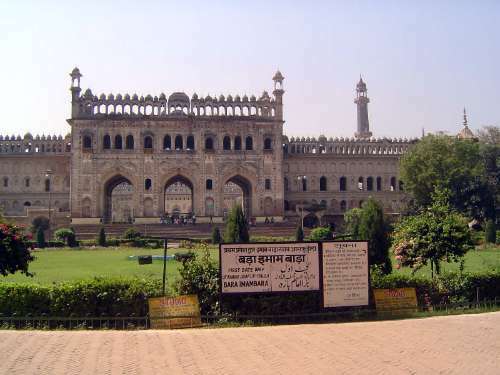 The third courtyard and the imambara proper. This is not a palace, not a mosque. Nobody ever lived here. 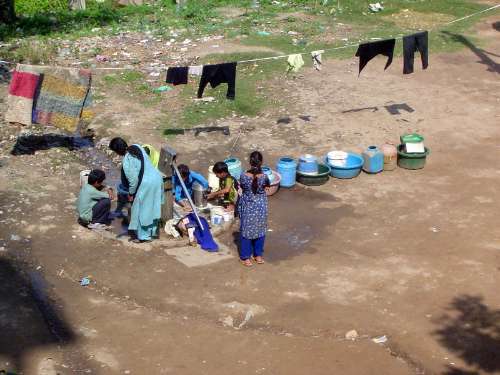 Instead it housed (and still houses) ephemeral taziyas, carried in an annual procession, then either buried in a karbala--a Shia cemetery--or inundated in the nearby Gomti River. 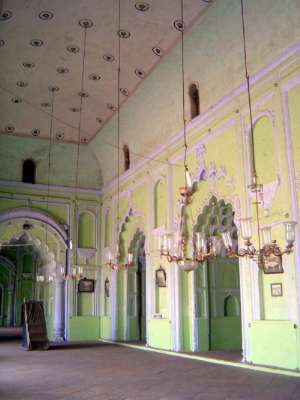 The hall measures 53 by 163 feet, and rises to a height of 49. Fergusson writes (II, 329) that "the hall stands without abutment or thrust, apparently a better and more durable form of roof than our more scientific Gothic vaulting; certainly far cheaper and far more easily made, since it is literally cast on a mud form." The ceiling is composed of rubble and concrete, which was left to dry on temporary centerings. 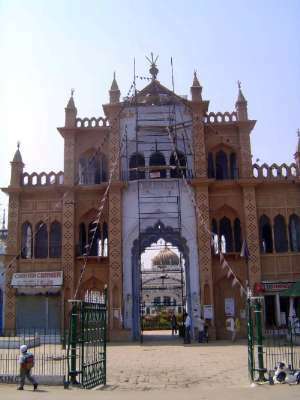 The imambara also houses the tomb of Ghazi-ud-din Haidar Khan, who died in 1827. 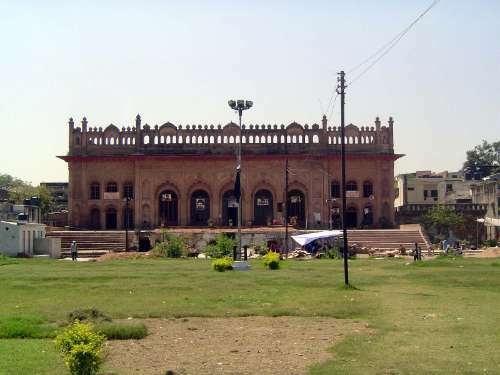 The second-best-known imambara in Lucknow is the Husainabad Imambara. Here is the entrance to the outer court, again now a road. Detail of the lakhori brick, small enough to be laid in decorative forms. 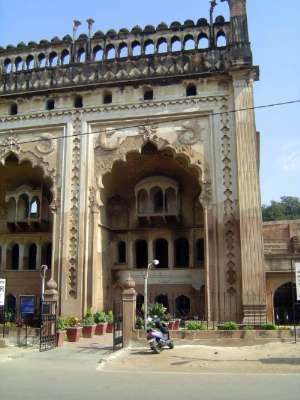 Entrance to the second courtyard of the Husainabad Imambara. 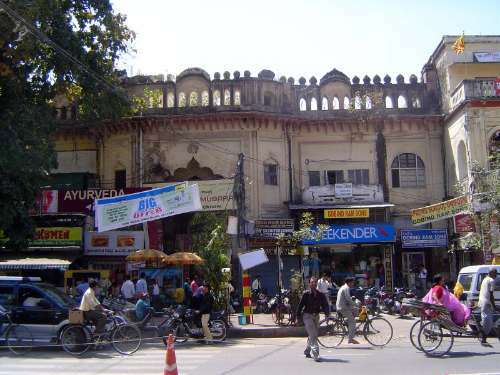 View from across the street; the imambara itself is straight ahead, with the gold dome. 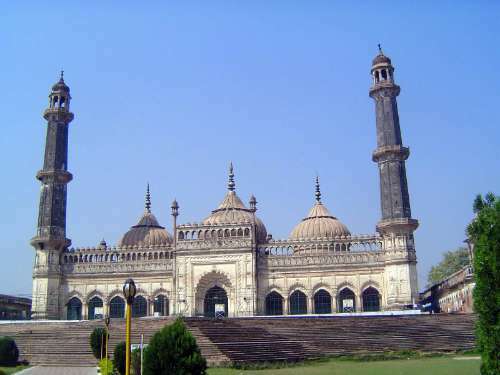 The imambara was begun in 1837 by Muhammad Ali Shah. The axis has always had a talao or pond. 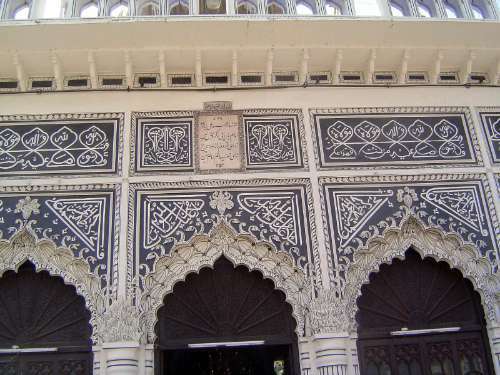 Calligraphy--a mixture of Urdu and Arabic--over the entrance. 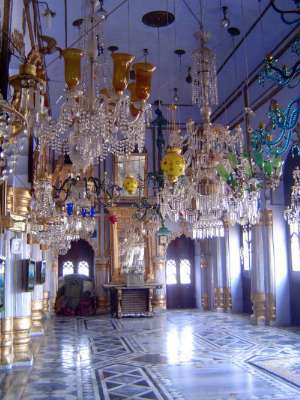 Entrance hall, with a riot of chandeliers. 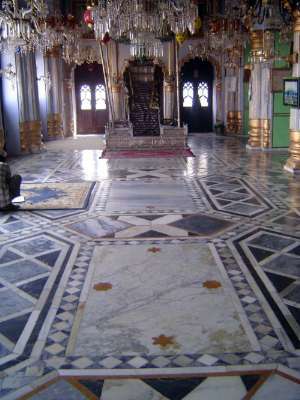 The inlaid floor is more to Western taste. 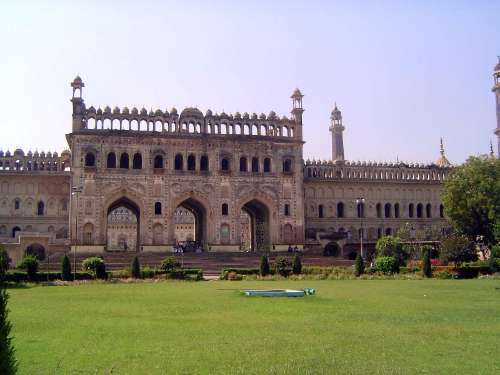 And here is the reason for the imambara's existence. It's a taziya representing the tomb of Husain, son of Ali and grandson of the prophet. 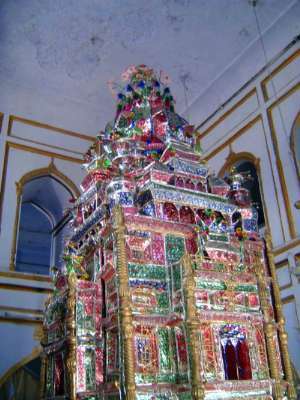 Thousands of such models are built annually and carried forth from imambaras, generally in the months of Muharram or Safar, especially on the anniversary of Husain's death in A.D. 680. The word taziya comes from an Arabic verb meaning "to mourn." 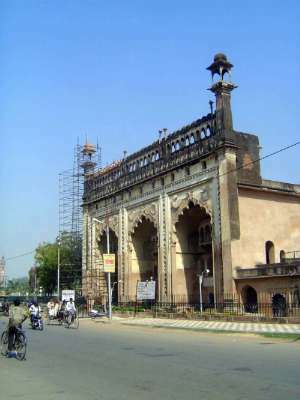 The nearby Jama Masjid, completed in 1845 by the widow of Muhamad Ali Shah. Off-limits to non-believers. 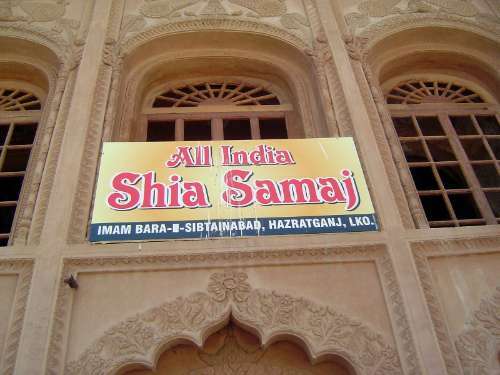 Lucknow has other imambaras. 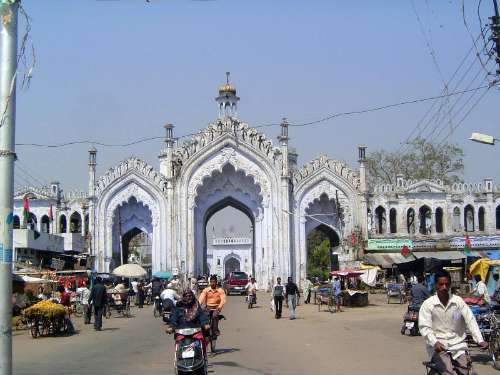 Here's the entrance to the Sibtainabad Imambara, still in use though not accustomed to tourists. 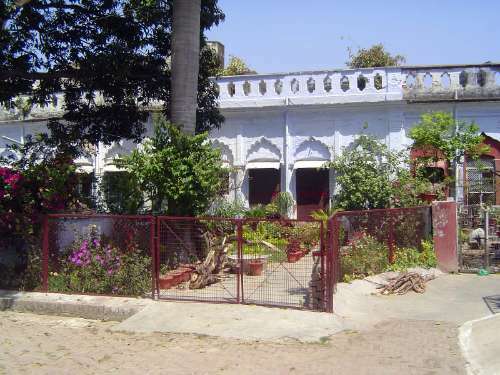 The imambara in its courtyard. The sides are lined with small apartments. 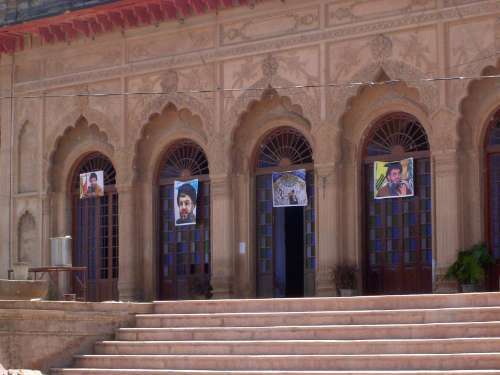 The building is an organizational headquarters for the community of India's Shia. Surprised? Shouldn't be: Hezbollah's Hassan Nasrullah is naturally popular here. So much for imambaras. 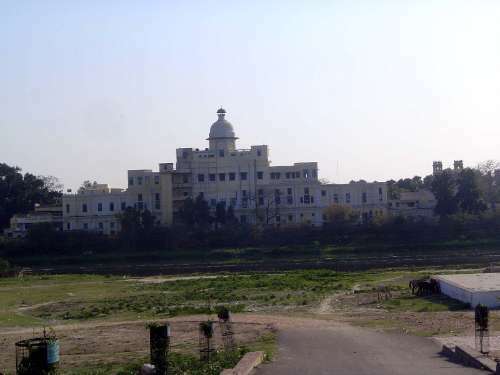 Here is the Bara Chattar Manzil, the "great parasol palace" seen from across the River Gomti. 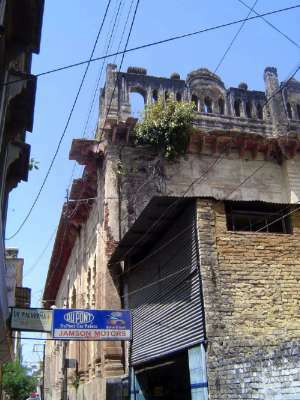 It was begun in 1803 by Saadar Ali Khan. Emily Eden saw the place about 30 years later and wrote, "Such a place! The only residence I have coveted in India. Don't you remember reading in the Arabian Nights, Zobeide bets her Garden of Delight against the Caliph's Palace of Pictures! I am sure this was the Garden of Delight!" Seen from the land side. It's difficult to photograph. 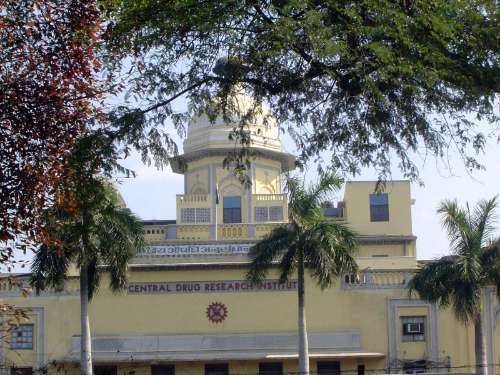 Used for a time before 1947 as the United Service Club, it now houses India's Central Drug Research Institute. 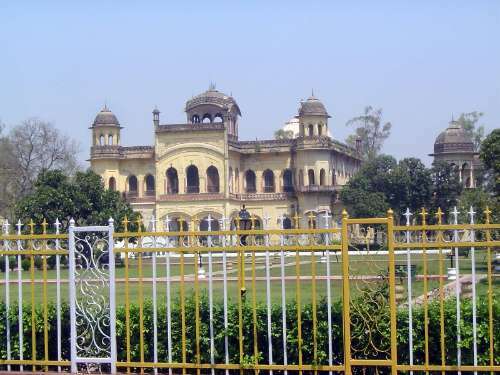 The last of the palaces built by the nawabs was called the Kaiserbagh, or Caesar's Garden. 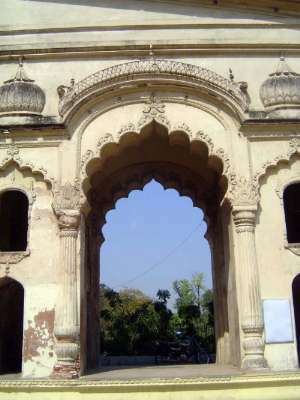 This is the Chaulakhi Gate leading out of the palace grounds. 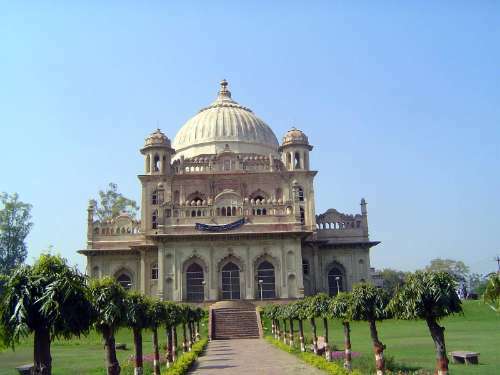 The Kaiserbagh was built in 1850 for Wajid Ali Shah. 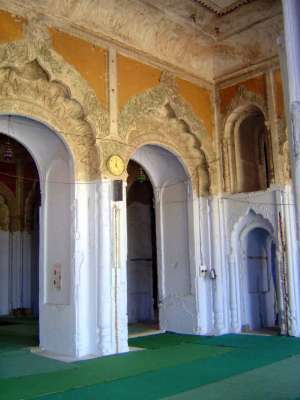 At the center of the enclosure is the Safaid Baradari or Taluqdar's Hall. 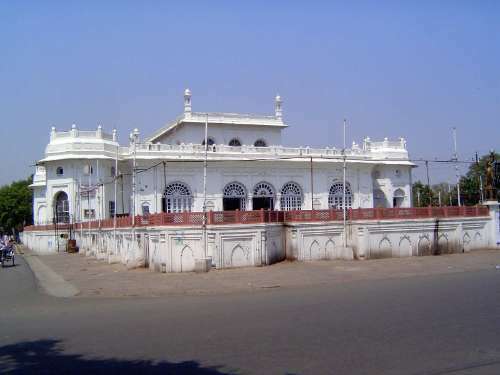 A palace building. Murray says that the whole place is built "in the vilest of taste". Fergusson is only marginally less brutal. He writes (II, 326) that the Kaiserbagh is "by no means unlike the Louvre and Tuileries... but instead of the beautiful stone of Paris, all was brick and plaster; and instead of the appropriate details of that palace, the buildings surrounding the great court at Lucknow are generally two storeys in height and singularly various in design... crowned by domes such as Rome or Italy never saw, and the whole painted with colours as crude as they are glaring." Base of the statue in the previous picture. 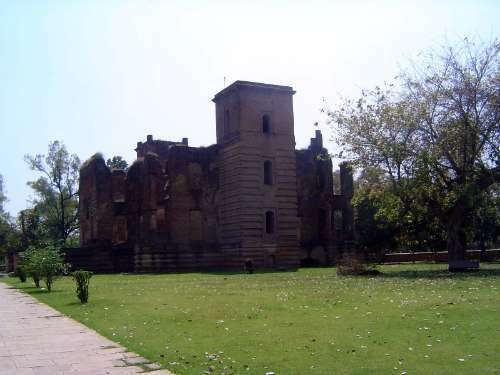 On the other side of the Kaiserbagh is this tomb, originally part of a larger structure that has since lost its flanking wings. 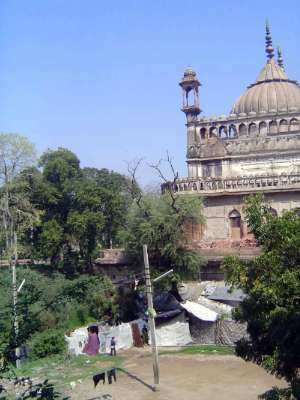 The same tomb, that of Saadat Ali Khan, seen from its far side. 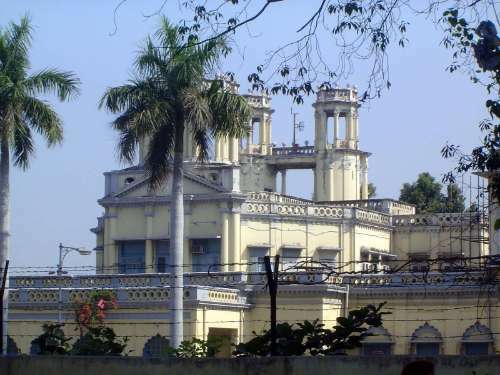 Saadat had lived in Calcutta and was well aware of European styles. 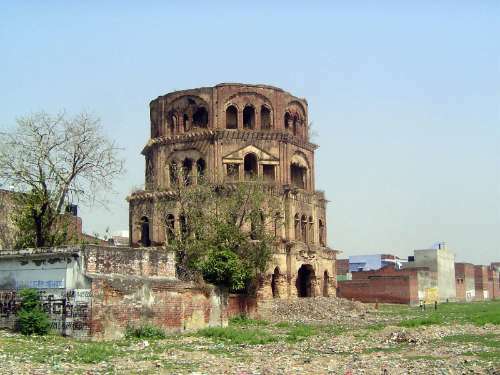 A watchtower, the Sat Khande, intended to rise seven stories, but abandoned at the death of Muhammad Ali Shah. 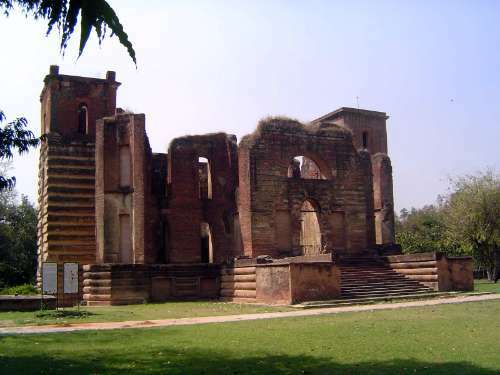 The ruins of Dilkusha, the "heart-pleasing house" built in 1805 for Saadat Ali Khan by his aide-de-camp, Gore Ouseley. Ouseley later served as British ambassador to Persia, and he was a founding member of the Royal Asiatic Society in London in 1823. The house is modelled after Seaton Delaval, a country house in Northumberland that was built in 1717-29 and now is also in ruins. 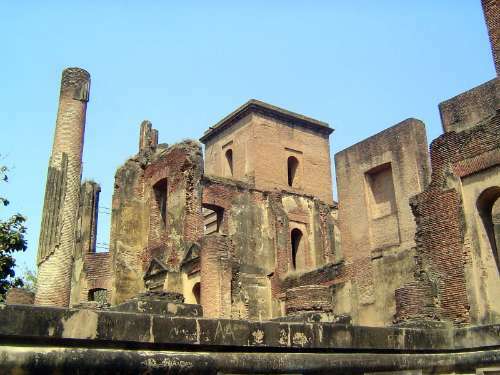 What's left of the facade facing the Gomti River. The opposite side, facing the town, had a portico with eight columns, each with a a very flat Corinthian capital. The floors were teak covered with tile, then covered with rubble and plastered. The whole thing was in ruins by the 1860s.